Due to the deep modifications that have been made, this version is to be considered a BETA, with potentially a few more bugs than usual. Preferences file format and database structure have changed: you will loose your settings and a full rescan of your collection will be required. You might as well install this version in a new directory and keep the previous one (not running at the same time though, or don't use the same ports). This new version has to be configured using the web interface: the previous desktop UI has been almost completely removed, keeping only the bare minmum so that you can launch it without using the command line if you don't want to. 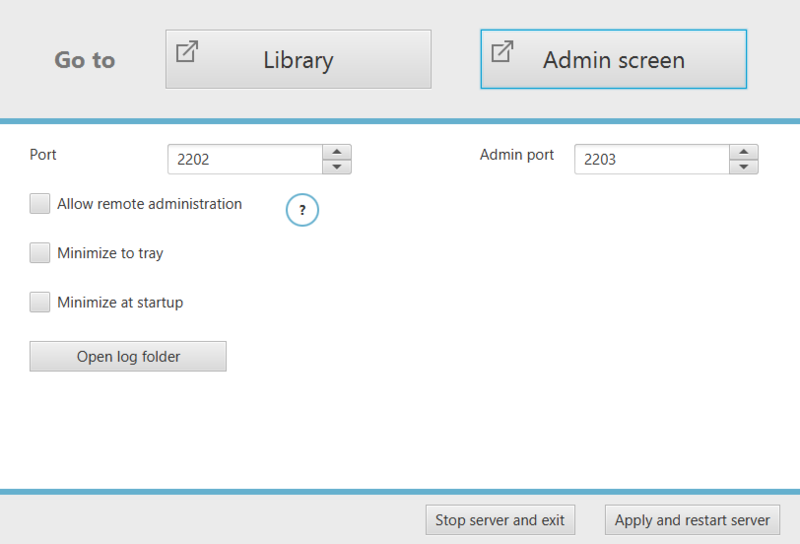 Ubooquity now uses two different ports: one for the administration page, the other for your library. The Modern theme is now the default theme. Now if you feel a bit adventurous, you can download the new version using the link below (the one on the "Download" page is still the last stable 1.10.1 version). Also, if you post messages about this version on the forum, please mention this is Ubooquity 2.0.0, not 1.10.0, thanks ! Here is the detailed list of changes. New internal HTTP server: NanoHTTPD has been replaced by Jetty. This should fix issues related to HTTP headers and connections. Bookmarks synchronisation: bookmarks are now saved on the server. You can start reading a book or a comic on a device and resume your reading on another one. Previous mechanism (saving bookmarks in cookies) can still be activated in the advanced settings. New UI: preferences have to be managed using the new web UI (which is now available on a separate port). The desktop UI is now a simple launcher, with a few limited options. Command line options have changed a bit too. Unreadable files are now ignored. Empty folders are now completely ignored as well. As mentionned before, the default theme is now "Modern". The legacy black theme will be provided as a stand-alone theme later. Comic metadata improvements. New fields are parsed: publisher, alt series, alt series index. Integration and display is not complete yet, though. 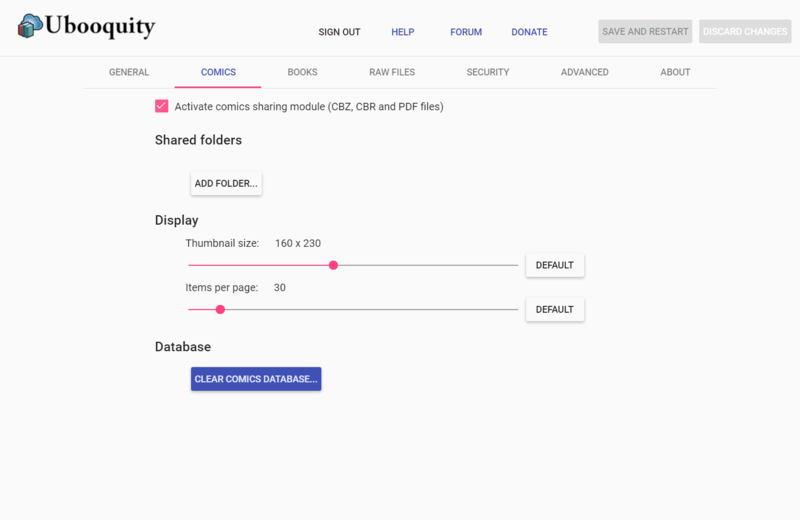 Books and comics are now displayed using their file name instead of the title found in the metadata. Exclusion patterns have been simplified; the pattern does not have to match the whole path anymore. Fixed a bug that prevented the fonts used by the online Epub reader from being properly extracted during Ubooquity startup. Fixed PDF description field set to "null" when metadata is not found. Fixed some PDF and Epub parsing issues. Fixed bug that prevented the reading of comics with a capitalized extension. I'll probably publish a few additional 2.0.x versions with bug fixes and small new features. If you want a more stable version, wait for 2.1.0.